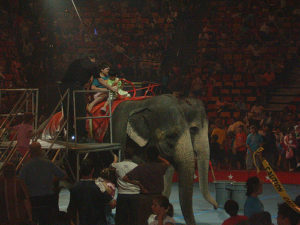 April 29: 12:00-1:00; 2:00-3:30 2:30-4:00; and 4:30-6:00 [the circus seems to have canceled the last show and changed the time of the 2nd]. No need to arrive early. The leader does not necessarily arrive more than five minutes before the start time. The location will be the south entrance to MCC, on Brighton Henrietta Town Line Road. We will be on the public sidewalk – we do not have permission to protest or park on MCC property. Please come out for as many protests as you can to show attendees that not everyone thinks the circus is fun for animals. Please do not shout or react to anyone shouting at us. Our silence is powerful dissent. Please wear no animal products (leather, wool, down, silk, fur) – circus attendees do notice and comment. For their safety and comfort, please do not bring animals. Stand on public sidewalk only, and do not block anyone: keep it legal. We welcome those who approach us with questions or for dialogue. Always be polite. If someone wants to talk to you but you’re not comfortable with that, you can give them a leaflet and/or refer them to the leader. Signs: ARRoc provides signs and we usually have plenty. If you wish to make your own sign, please be sure its message meets ARRoc’s Core Values. Graphic images, which cause people to look away, may not be as effective as a clear, short, simple, written message, which people do read. Weather: Rain or shine. Dress for the weather. Umbrellas are fine. Consider bringing one more layer of clothing than you think you need, and consider gloves – your hands will be exposed for 60-90 minutes. Check this post in our web site* in case of dangerous weather. Bathrooms: No bathrooms – come prepared! The best time to speak out is before the circus arrives: letters to newspapers, letters to schools, sponsors, local government, and venues.